High noon, 14 November 1944. Eleven P-38s of the 80th Fighter Squadron "Headhunters" weaved back and forth above two groups of B-24s droning north at 16,000 feet toward Japanese-held Alicante Airdrome, located on Negros Island in the Philippines. Major Jay T. Robbins, leading Blue Flight, sighted one Zeke and three Oscars 8,000 feet below at 10:00 o'clock and dove to the attack. 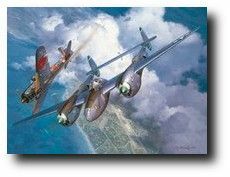 Suddenly aware of the three Lightnings screaming down upon them, the four Japanese fighters split into two elements of two, one element breaking right and the other left. Then, in Robbins' own words, "I followed the two that broke to the right...I made a shallow dive went underneath and to the outside of the enemy leaders' gradual right turn, giving my plane the throttle I drove up to within 150 feet before opening fire...My first burst knocked pieces out of his rudder and left wing and my second burst hit the canopy which blew off, barely missing my plane. Black smoke and bursts of flame came from the left side of the plane...both the pilot and plane fell to the ground several miles northeast of Alicante drome." This victory, Major Robbins' 22nd, proved to be his final victory of the war. Completing his combat tour two weeks later, he returned to the United States. Hand signed by the Ace JAY T. ROBBINS and artist ROY GRINNELLl.